Backyard birds offer so much enjoyment to our gardening experience. They are part of the reason we garden in the first place – to participate in and support the nature around us. As organic gardeners, we know that a bird’s life is greatly influenced by the environment. And that is why it is so important that we support our feathered friends with our gardening practices. In this episode, we visit esteemed author Margaret Roach to explore the unexpected benefits of attracting birds to your backyard space and learn tips for supporting their habitat. We even learn how birds can influence our garden design. Then, we visit the Cornell Lab of Ornithology to see how the latest technology is being used for bird watching and how we can do our part to help in citizen science projects that support bird research. Cornell has an incredible amount of free resources for us online. We have listed several below along with the citizen science projects mentioned in this episode. But this is only a small portion of the extensive online info. Be sure to explore all the links below for even more information. Margaret Roach – A Way to Garden: We have featured Margaret on our show before (Gardening with Nature) and her website offers a wealth of gardening know how. Making A Garden for the Birds: Great resource page on Margaret’s blog on birds and gardening. 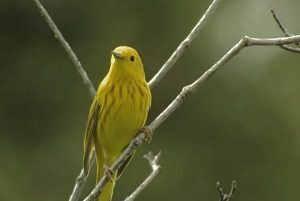 All About Bird Biology – (Interactive) – This site digs deeper and offers interactive learning. It has interactive features and a multimedia library. There is also information on Birdsong Hero and other apps. Special thanks to The Cornell Lab of Ornithology for their extensive support and media sharing for this episode. This was a great show, I learn what I been calling a woodpecker was really a Yellow bellied sapsucker, I think I need to buy a few books and learn more about the birds in my back yard. Actually, I believe that Yellow Bellied Sapsuckers are in the family of Woodpeckers. Fantastic show as always. I have gradually become more and more interested in birds since moving from SE VA to south central PA, which is much more rural. With the sprawling farms around us, I have less birds to enjoy, not sure why, but I will find out why and change that. Keep up the great shows. I must tell you, it is about time that something like this site/program was started. I say this because I am one of many few that still depend on what is grown in our backyards, and to this day I am so happy and proud that I grew up learning about how much nicer and better of an idea it is for children to grow up learning not just about but how to do so. I must also say that I believe that at believe that at-least one of many of the classes that are in every grade should be replaced with a simple class just to teach children a task that can help both them and the world that not just we live on but so do other living animals, that need our help to restore there world and lives to prevent loosing another animal to extenction. This was a FABULOUS episode. Nothing better than birds and gardening!